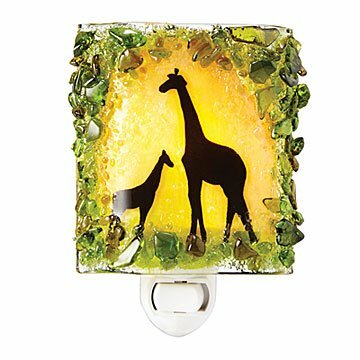 This recycled glass nightlight features a sweet scene of a baby giraffe. The soft glow of this painterly nightlight illuminates a sweet scene of a baby giraffe tagging along with its parent for protection. When lit, the luminous glass mosaic fills a room with ambient colored light that's bright enough for safety, but soft enough to sleep through. The colorful, textured glass is made from 100% post-consumer bottles, kiln-formed by artisans Vawn and Mike Gray. Handmade in Cape Coral, Florida. Hold by plug, not by shade, to prevent unnecessary stress on light. Power Prongs do not rotate. This Is An Extraordinary Product! It lights up the bathroom perfect for at night. Product is an excellent piece that adds light and art to any wall! It will be used in a powder room bathroom. It gives off enough light you don't really need the primary lighting on. Love the nightlight, simply elegant and beautiful. This nightlight is functional and pretty. Our kids were so excited about it. Love it!! I like the selection of unique products. Adding art to any plug in the house! A perfect night light for the nursery.